Congrats! 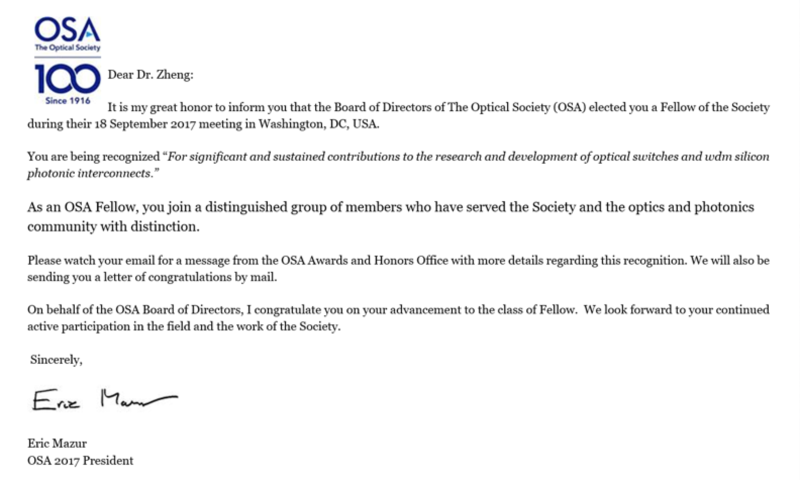 Dr. Zheng (Fafa) a new Fellow the Optical Society of America (OSA)! According to the announcement of the OSA Awards Office, Dr. Zheng has been elected as a 2018 OSA Fellow Member. OSA Members who have served with distinction in the advancement of optics and photonics may be proposed for election to the class of Fellow. The number of Fellows is limited by the Society's bylaws to be no more than 10% of the total OSA Membership and the number elected each year is limited to approximately 0.5% of the current membership total.